At Belmont Fencing we supply brushwood fencing, brushwood screening, frames, brush roll finishes, gates, fittings and accessories. 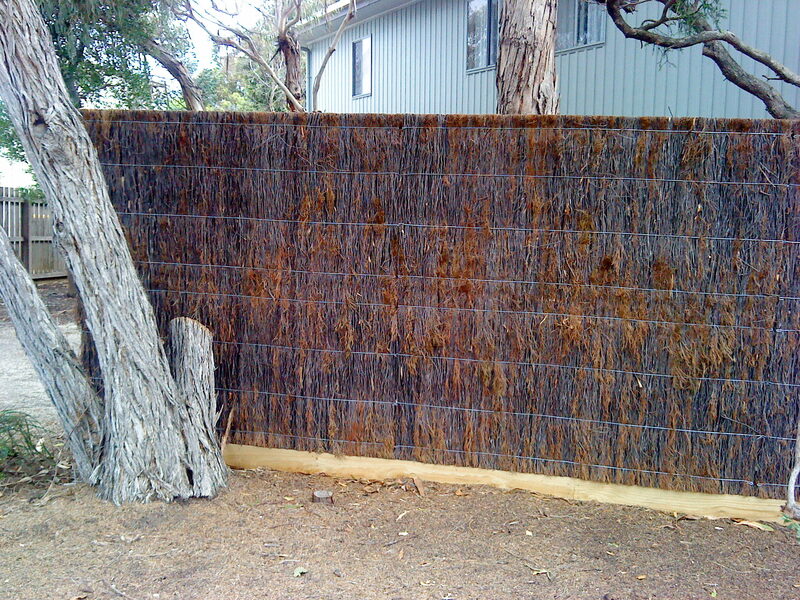 Brushwood fencing – also known as brush, broom, broombush or brushbox – is manufactured from Melaleuca uncinata, an Australian native lignotuber which is found naturally occurring over vast areas of Australia. Brushwood comprises many different naturally occurring provenances of Melaleuca and the colour of the bark varies from a light grey to black, ‘mottly’ grey-black and red colourings. The lifespan of the cut brush when packed in a fencing panel is long, maintenance is low, and it has white ant resistant and thermal qualities. When you are looking for a natural and effective method to beautify any surrounds or for a landscaping project or privacy fence screen, brushwood fencing panels are the ideal choice. Brushwood is of natural look and neutral colouring, which blends well with garden beds and man-made structures. Brushwood also has noise and thermal attenuation properties, ideal for cutting unwanted road noise and protecting adjoining plant beds from the hot northerly sun. Typical uses of brushwood include; fences, dividers, privacy fence screens, partitions, service enclosures – (such as rubbish or trash, pool pump, golf course service yards, car park enclosures), windbreaks, temporary event screening, tourist resort screening, screening of building extensions and service yards, thatch hut roofing and pergola and shadehouse roofing, patio and swimming pool surrounds, water features, equestrian horse jumps, aviaries, bird feeders, topiary (emus and kangaroos), garden borders and as a replacement for wood fencing, bamboo fencing, picket fencing, pvc fencing, iron and Colorbond fencing. It is also very versatile in that it can be used on sloping sites and can be tapered, scalloped and blended into structures like profiled pillars and tree trunks and cut over uneven bases and walls.